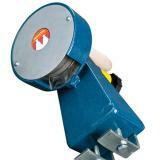 A strong, durable hand grinder. 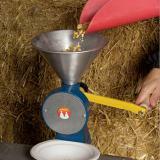 Crack corn to feed your animals or grind your home grown grains to flour. 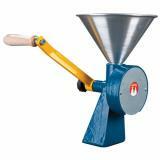 Uses two metal discs that grind closely together to reduce grains (corn, wheat, etc) into cracked grains or by adjusting the tension on the wheels they can readily produce excellent flour. Includes clamps to mount to a table top for easy use. Allows you to create your own flour to be self sufficient and have control over your food supply for increased food safety and a healthier diet. Also allows those with only a few animals that want to provide cracked corn the ability to do so without having to pay for expensive cracked corn. 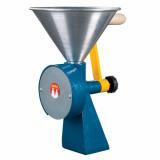 Once mounted to a table top, make sure to insert the hopper into the top of the cast iron grinder. Now proceed to pour the grain to be grinded into the hopper and turn the handle in either direction for several cranks, study the material coming out and adjust the tension accordingly to obtain the particle size you desire. 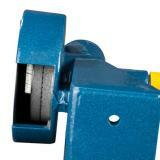 Tightening the tension produces a smaller end product, loosening the tension results in larger particle sizes. Be careful to securely fasten the grinder to a table top or something similar. A loose set-up will have slow output. During use, the grinder may not readily turn after several turns due to grain particles wedged between the wheels, a simple quarter/half turn in the opposite direction should free up the grinder and you can proceed turning the handle in the original direction again. 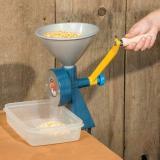 We purchased this hand feed grinder to crack corn for our lambs. It cracks a very little amount of corn. 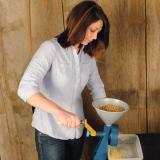 We were hoping to crack a 5 gallon bucket of corn at a time. We tried to adjust the discs to allow more corn to go through and tried to turn the handle as fast as possible, but it takes an extremely long time to crack barely any corn at all. We have a 30-day guarantee policy and took the item back with no questions asked.